I can honestly say there’s no show quite like the Tokyo Auto Salon. There are other tuner shows like SEMA and the Essen Motor Show, but the TAS has its very own and unique style. When the rest of the world is oohing and aah-ing over the latest tech and the latest trucks, this unmistakably Japanese show is where things get wonderfully weird. It’s not a big show, despite over 880 vehicles displayed across 11 halls. You can do a lap of the whole thing in about two hours. Of course, you’ll need more time to take everything in. For 2018, 319,030 people were in attendance over the three days it was held, making it the fourth year in a row where attendance has been over 300,000. It’s a show that just gets bigger every year. There’s good reason why TAS is held every year and the Tokyo Motor Show is every two years: It’s just a more enjoyable event to attend. What started off as the “Tokyo Exciting Car Show” back in 1983 (I wish they had kept that name because it is amazing) is now in its 36th year and has become both a custom car and an entertainment show in one. If you want your fix of a pure, unadulterated shot of JDM in one big crazy go, TAS is the place to get it. What I love most about this one is it knows it’s not a serious motor show—it leaves that to the Tokyo Motor Show, with its new car reveals and industry news. While there were a couple of new concept debuts, namely the Toyota GR Super Sports Concept and the Subaru VIZIV Performance STI Concept, most of the cars on display were of the crazy tuner variety. While we’re on the GR Super Sports Concept, I asked Toshiharu Takasu, Marketing General Manager at Gazoo, if the SSC would ever see the light of day. Every year there are more foreign cars displayed at TAS, but it’s still a very Japanese show. Like the previous three years I’ve been, the obsession with over-fenders is still very much alive, as demonstrated by the controversial Liberty Walk Miura. Once you’ve seen one you’ve really seen them all. So instead I’ve focused on some of the non-over-fendered cars that caught my eye, including some clean stanced cars. It’s nice to know simplicity is still something tuners appreciate, as evidenced by the orange Toyota Crown. Every year, there are a couple of cars that get showcased more than others at TAS. Last year it was the new MX-5. This year it was the Lexus LC. I know I just said a whole thing about over-fenders, but you have to admit that Liberty Walk’s first attempt at a Lexus car is pretty damn good. The other LC kits had more subtle looks and wheel changes. The Toyota C-HR looked pretty nice with bigger wheels, lowered suspension, and some aero parts, though I’m not sure those would do much with performance. Minivans are popular as ever in Japan. They’re still the go-to vehicle for sensible families. With a market full of generic vans, it’s no surprise some want to make their stand out. There’s an entire aftermarket, erm, market, for vans in Japan. Want over-fenders on your Toyota Hiace? Sure. Want to be a mobile DJ? Sure, just put some loud speakers in your Honda Odyssey. There’s everything from slammed vans, camping vans and even “luxury vans” with seats that turn into a leather trimmed bed. More amazingly, the Prius was still a popular base car to modify. One that caught my eye was the Dazer Prius-X lifted off-road version by CarStyle. This was shown last year as well and is still as funny as the first time I saw it. It’s perfect for those who want to go out and see the environment they’re saving. What also hasn’t changed is the love for big wings. The HKS stand delivered with what can only be described as the biggest wing I’ve ever seen on a Toyota 86. The Suzuki Swift Sport next to it channeled a bit of Escudo Pikes Peak, too, though a Swift with a Pikes Peak inspired kit would be a great thing to see at the next TAS. Ever so slowly, European cars are becoming more and more common at TAS. 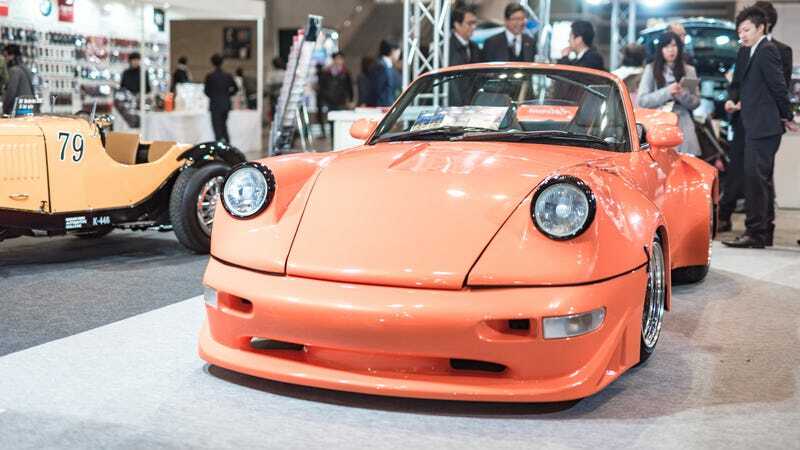 Apart from the obvious Liberty Walk exotics, RWB Porsches, and Morohoshi Lamborghinis, more “humble” European cars received the TAS treatment too. The pink Audi Q2 looked rather nice, as did the BMW 5 Series Touring from 3D Design. But it was the Desima Japan BMW Z4 which looked liked a Shelby Cobra that really caught my eye. An honorable mention also goes to the widebody Maserati Quattroporte by Ninja Design who had a ninja pose next to the car. You can’t even make this up. Like American cars? TAS has you covered, too, though don’t be too surprised most are trucks. More specifically, the Jeep Wrangler is a star here. Even in Japan there’s a huge following for the Wrangler and a few keen modifiers. There was at least one modified Wrangler of some sort in nearly every hall, which is quite impressive for a market where Ford pulled out and seeing a Cadillac is rarer than seeing a Maserati. For the ultimate East-meets-West, the Rocket Bunny Ford F-150 at the Toyo Tires stand was quite spectacular. This year’s TAS also marked the inaugural BH Auction from Bingo Sports. As you may have heard around the Internet in the lead up to TAS, the auction had some interesting lots including a Top Secret Toyota Supra, a Spoon NSX-R GT, and a Nissan R90CK Group C racecar. Some of the headline prices include ¥35,520,000 ($319,324) for a R34 Skyline GT-R with only 10 km on the clock. The NSX-R GT sold for a final price of ¥18,700,000 ($168,113) while the Toyota 2000GT sold for ¥83,360,000 ($749,406). The most expensive car from the auction was the R90CK which went under the hammer for ¥193,000,000 ($1,735,070). It’s the first time an auction of this pedigree has been held in Japan in recent years. BH Auction want to be the Japanese version of high-end auctions such as RM Sotheby’s and Gooding & Co.
As great as these all are though, what makes TAS memorable every year are the never-ending wacky cars and the seemingly never-ending imagination of some of the tuners. One of my highlights from the show was the Toyota Crown Majesta, which looked like a four-door Ferrari if it was in an anime. The company that did the Daihatsu Copen-based faux-911 and Nissan March based Rolls-Royce replica should be commended for their efforts. The latter car in particular was quite something to behold—it just stretched on forever. It reminded me of those limos the old Top Gear guys made a while back. There’s never a dull moment at TAS. It’s no surprise creations like these are around because the various design and engineering schools that showcased some of their students’ work are just as incredible. Take the Nihon Automotive Technical School (NATS) as an example. Their stand is always a source of entertainment at every TAS. This year they had the MINI Reborn, which looked like it had come back from the year 2118. The brown paint with the silver wheel covers were a nice contrast. They also had the Vellfire Pickup, which started out in life as a premium minivan. From the Saitama Institute of Automotive Technology was what can only be described as a Toyota Will vS jet fighter. It had gullwing doors (because why not? ), a jet thruster in the boot and a widebody kit. But that was nothing compared to the creation from the Toyota Technical College. Last year they had an aquarium-inspired Toyota bB; this year they had a castle-inspired Celica complete with tatami mats, bonsai trees, origami cranes, kadema gear stick, kimono style seats, and a freaking castle on the roof. There’s literally so much else at TAS it’s best to just come see it for yourself. Don’t question the logic behind some of the creations, just embrace it and move on. It’s the most enjoyable auto show I’ve been to and really sums up the wild, crazy, diverse and inclusive automotive culture in Japan. You should definitely go next time. Fast wagon with a roof box. Yes. The Zonda Anija. More to come. Sometimes I wonder if TAS is a show about cars or girls? Who needs padded back seats? “be different”. It’s certainly that.